DeQuevains surgery - what happens? Surgery may be necessary for those patients with DeQuervain's disease that fails to respond to non-operative treatment. It is a relatively minor operation performed under local anaesthetic as a day case. You will receive a letter with the details of the date and time of your operation. This will provide you with information of what to do and expect during your treatment. Some hospitals now routinely have pre-operative assessment clinics where you will see a nurse and any medical issues explored. You will also be given advice on what post-operative painkillers (analgesia) is likely to be required, which is usually paracetamol. As your operation is done under local anaesthetic there are usually no restrictions on eating or drinking before surgery, although you should check with your surgeon to be sure. You should arrive at your alloted time. Your pre-operative letter will tell you whether you require to bring any specific items, although it is common requested that you bring a dressing gown and slippers. The nurses will complete some paperwork with you and check your medication. Your surgeon will also see you to ensure that you understand what is going to happen and answer any questions that you may have. You will sign a consent form and an arrow will be put on your arm using a felt tip pen (this is routine practice to identify the correct side that will be operated on). Once the anaesthetic has worked your surgery can take place. 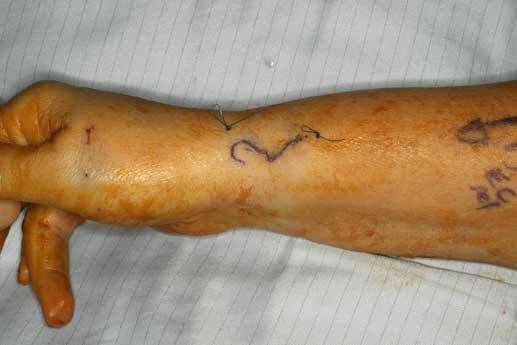 The skin is cleaned with antiseptic fluid painted on the skin and sterile towels are used to cover the area. Some surgeons will use a tourniquet to prevent blood from entering the arm. In this case you will be aware of a tight bandage on your upper arm, which is similar to the cuff used when you have your blood pressure taken. On average the operation takes less than 10 minutes and it is not usually painful. You may be aware of tugging and pulling sensations but this should not hurt. If you have a personal music player you are welcome to listen to this during the operation. 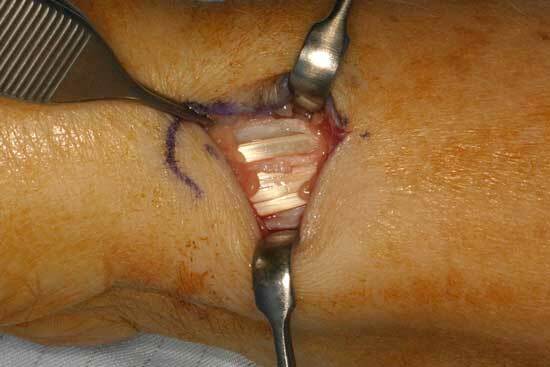 Figure 1: The fisrt extensor tendon compartment has been released. The underlying tendons can be seen. Figure 2: The wound has been closed with absorbable sutures. It is not normally a painful operation, but if you experience any discomfort then you should take some of your analgesic tablets. You will need to keep your bandage dry and this will remain for up to 2 weeks. When you attend your follow up appointment your stitched will be removed, although some surgeons like Mr Farnell use dissolvable stitches which do not need removing. 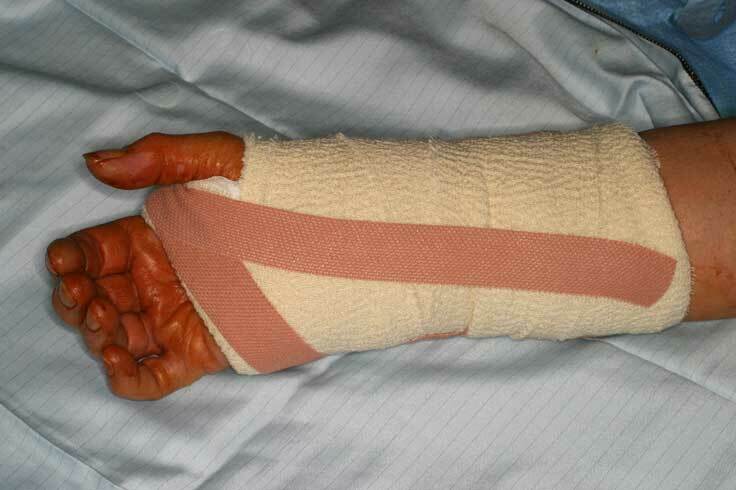 It is unusual to require physiotherapy after a carpal tunnel decompression. Scar tenderness - this is the most commonly experienced problem. It can be a nuisance and it usually resolves completely. Massaging the scar with a moisturiser helps. The outcome is usually good after surgery and the pain should resove gradually. The surgical scar will fade with time.